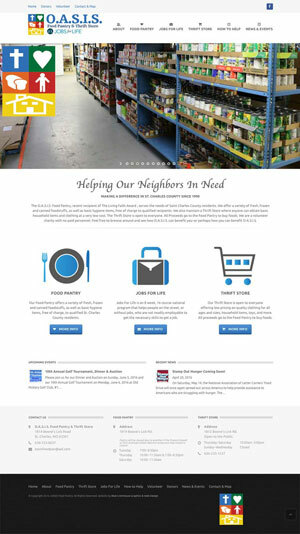 Blue’s ArtHouse just completed a website redesign for O.A.S.I.S. Food Pantry and Thrift Store in St. Charles, MO. OASIS Food Pantry provides free food and hygiene products to needy families in St. Charles County. They also house a thrift store where clothing and other basic household items are available for a very low cost. This project is very near and dear to my heart since I volunteer at OASIS and run the food pantry once a month. We always are happy to have volunteers so if you’re interested in helping at the food pantry on the fourth Tuesday of every month from 6-8pm, let me know!